Hamish MacInnes is known as the “Father of Scottish Mountain Rescue” is recognised as having developed modern mountain rescue into its present form. Hamish founded the Glencoe Mountain Rescue Team back in 1961. In 1965 he started the Search and Rescue Dog Association (SARDA ). He and Eric Langmuir worked together to start the Scottish Avalanche Information Service. Hamish also wrote the International Mountain Rescue Handbook, first published in 1974 and this book is still regarded as the standard reference work on Mountain Rescue techniques. 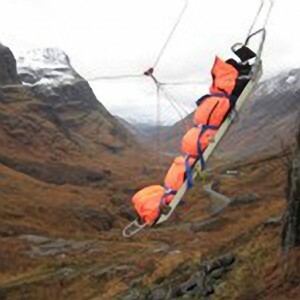 Acutely aware of the difficulties the rescue teams faced when trying to save the lives of those in trouble on the mountain, Hamish determined to improve the design of the equipment they had available. This quest has become his all consuming passion. The original, one piece stretchers were heavy and bulky. Carrying them up the mountain required two members of the rescue team to work together. During the early 1960’s Hamish designed his first folding stretcher. While an improvement, this folded stretcher was still too heavy and bulky for one man to carry. Even when split into a two part stretcher, the weight of a half stretcher and all the associated equipment was near the limit of what one man could carry while expected to climb fast. The great benefit of splitting the stretcher was that the two men could climb faster if they could do so independently. The ongoing search for improvements has taken Hamish’s original stretcher through many design iterations. The current aluminum Mk6 model weighs 25 Kg when loaded with the equipment required by the rescue team. The success of the MacInnes Mk6 has taken it to all parts of the world.